Today we had a letter from the Minister of State for School Standards. 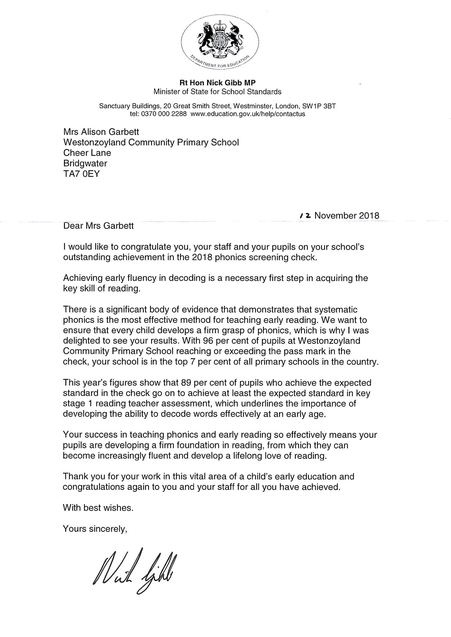 He wrote to congratulate the children and staff at our school on a fantastic achievement in Phonics! 96% of the children reached or exceeded the pass mark in the 2018 Phonics Screening Check, which puts our school in the top 7% of primary schools in the country. A copy of the letter is below. Well done everybody!